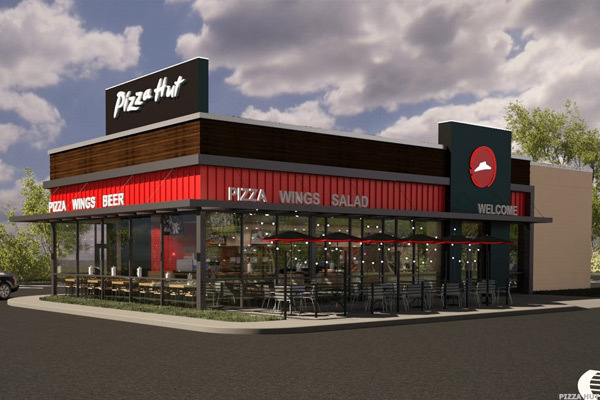 Pizza Hut has kicked off the year with a goal of remodeling roughly 700 of its U.S. restaurants with a sleeker design and some new offerings. Pizza Hut as a place to grab a cocktail after a strenuous day at work? The time may be fast approaching. Yum! Brands (YUM - Get Report) owned Pizza Hut, which currently operates over 6,000 restaurants in the U.S., has opened several newly redesigned restaurants in Texas, a spokesman confirmed via email to TheStreet. Decked out in Pizza Hut's trademark red and black colors, albeit with deeper hues, the locations feature wraparound windows, outdoor seating and yes, a drive-thru. The spokesman also confirmed the locations serve beer and wine. Pizza Hut plans to remodel roughly 700 of its U.S. stores a year through 2022 in the new format. "The franchisees have committed a number that at least starts with a 'B' (billions of dollars) on transforming the [Pizza Hut] assets. I actually think that the biggest surprise, or the upside surprise, that may quietly shock everybody is the turnaround in our Pizza Hut performance," said Yum! Brands CEO Greg Creed in a Dec. 11 interview with TheStreet. Pizza Hut is now serving alcohol at its newly remodeled restaurants. For a fast-food chain known for serving affordable pizza via delivery and at one time all-you-can-eat buffets, the new look is quite a departure. And the boldness in terms of store design may be what's needed for Pizza Hut to reconnect with consumers migrating to fast casual chains such as Chipotle (CMG - Get Report) and to revive sales that have lagged pizza-making rivals Domino's Pizza (DPZ - Get Report) and Papa John's (PZZA - Get Report) of late. Yum! Brands expects Pizza Hut's same-store sales in the U.S. to rise 3% in the fourth quarter after being unchanged in the third quarter. By comparison, though, Domino's U.S. same-store sales surged 11.5% in the third quarter following a 12.8% gain in the second quarter, while Papa John's clocked in with a 3% U.S. same-store sales increase in the third quarter after delivering a 5.5% gain for the second quarter. Pizza Hut is not alone in sprucing up its stores to signal to consumers that a better product may be coming out of the ovens inside. By 2017, Domino's intends to finish refurbishing its entire store fleet. The "pizza theater" concept, as Domino's calls it, features a sleeker-looking interior and exterior, with seating both inside and outside, new features for a chain known for its delivery cars. Customers can even watch their pizza being made in the spirit of how food is prepared at burrito chain Chipotle. Unlike the new Pizza Hut locations, though, Domino's refurbished restaurants are not selling alcohol.